AND LATER, WILL THE HOSTAGES BE ABLE TO ESCAPE WHILE FALLON’S MEN ARE OCCUPIED WITH THE SHIP? “What’s he doing, Tori?” Lily whispered. She moved closer to her sister. The night had turned colder, and the girls’ clothing was becoming threadbare and ragged. “Or a rope, maybe,” Lily said innocently. Tori didn’t say anything. She reminded herself that Lily was, after all, only eight years old. And she, at eighteen, knew how the world worked much better than little Lily did. At least Lily had stopped crying all the time. Now, Tori wasn’t sure if that was an improvement. Lily sometimes scared her, the way her eyes looked hollow. Like there was no feeling left in her. Tori had no mirror, but her little sister looked like she herself felt. Older than she should be. And sad. But Lily didn’t seem to be afraid any longer, and Tori supposed that was a good thing. Tori knew what Fallon intended to do with her and Lily. But the initial shock and fear of Fallon’s intent was overshadowed by other things that had actually happened. The violent deaths of their parents and younger brother, the endless days of riding with scant food and water, the bone-deep weariness that never let up, not even when she slept on the hard ground at night next to Lily. She was responsible for Lily, now that her parents were gone. She squared her thin shoulders, her gentle eyes turning hard for a moment. She would protect her sister, no matter what. Tori watched as Fallon ordered three of his men back into the water yet another time. Even if they could see what they were diving for, it would be too deep to reach. But the scene helped Tori realize just how unstable Andrew Fallon was. Once or twice, she’d caught herself thinking he was almost a nice man. He’d brought her and Lily a blanket one cold night. And he’d given them extra rations another time. But she knew he was not nice, not even sane. Evil, was what Andrew Fallon was. Evil, and most insane. She watched him, posturing and screaming at his men, who were so terrified of him that they were making fools of themselves trying to dive for an unreachable goal, a ship that may contain treasure, but just as well may not. A vessel that was impossible to get to, all the same. Especially in the pitch-black night. Lily leaned against her, her weight heavy with sleep. They sat beside a tree, their backs propped against the rough bark. The night was cool, and Tori had drawn the blanket close around them. She sagged against the tree trunk, her arm around her little sister, as Lily’s eyelids drooped. During Women’s History Month, posting about an influential woman seems appropriate. I enjoy finding women not universally known. Patricia de la Garza De Leon is such a woman, yet she was tremendously important in pioneering and founding the town of Victoria, Texas. Doña Patricia was the matriarch of one of the prominent founding families of early Texas. She raised ten children, some of whom helped change the course of history. 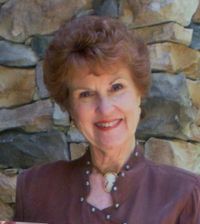 Patricia de la Garza was born in Mexico about 1775 in Soto la Marina, in what is now Tamaulipas, Mexico, to a wealthy family. Her father, Felipe de la Garza, served as commandant for the Spanish government. She married Don (Spanish for a titled man) Martín De León in 1795. Martín de León was born to a wealthy family from Spain, and although offered the chance to study in Europe, he chose to stay in Texas as a merchant and supplier to the miners of Real de San Nicolás. Patricia and Martín settled at his ranch in Cruillas. Martín sold wild mustangs, mules and cattle in New Orleans. 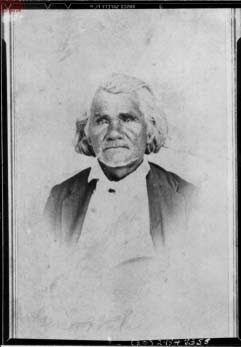 The couple's first child, Fernando, was born at the Cruillas ranch in 1798. The couple moved their base of ranching operations in 1799 to San Patricio County, Texas, where three more children were born. Between 1798 and 1818 Doña De León gave birth to ten children. In 1805 the De Leóns moved to the east bank of the Aransas River, north of Corpus Christi. They moved several more times before 1824. Ranching in Texas, De León had repeatedly petitioned the Spanish governor in San Antonio for permission to settle a colony in the area of his ranch. He was denied due to a combination of political problems in Mexico and some rumors that the De Leóns were not loyal to Spain (which, it turns out, they were not). Patricia and Martín didn’t understand why their petitions were denied when others, like those for Moses and Stephen F. Austin, were granted. During this time, Martín continued ranching around Texas, and the family moved several times. The number of head of livestock they owned quickly grew, and De León began driving cattle to various markets. He was one of the first Texas trail drivers. De León also bears the distinction of using the first cattle brand in the state, which he developed while living near Corpus Christi. The brand was an interconnected E and J, which stood for “Espíritu de Jesús.” He was well respected as a fighter of Native Americans, but he often avoided violence from raiding parties on his cattle drive by feeding them beef. To the Native Americans, he was known as Capitán Vacas Muchas (Captain Many Cows). 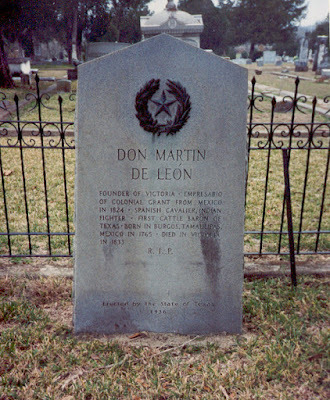 The De León family sided with the Mexican rebels in the Mexican War against Spain. On April 13, 1824, the provisional Mexican government granted Martín De León an empresario contract to settle forty-one Mexican families on the lower Guadalupe and Lavaca rivers. At age 49, with her four adult children and six minor children, Patricia de la Garza De León uprooted her life to become her husband's partner in the founding of De León's Colony. The De Leóns paid for the colony themselves with profits from their cattle trade and with an inheritance from Patricia’s father of $9,800, plus another $300 valuation of cows, horses, and mules, in order to help get the colonization off the ground. The only predominantly Mexican colony in Texas, Martín named the settlement Guadalupe Victoria in honor of the first president of Mexico. At Victoria, Doña Patricia transplanted cultural traditions of Mexico and Spain to the community. The De León family lived in a log home with a dirt floor. Nevertheless, the family had domestic servants and Doña Patricia filled the house with imported furniture provided from her family in Mexico. As the family's wealth increased she imported fine furniture and clothes. She and her daughters became known for their excellent embroidery skills and beautiful clothing. The De León home was described as among the most beautifully furnished in the area, and it became the center for community gatherings. Their surviving children were Fernando (1798), Candelaria (1800), Silvestre(1802), Guadalupe (1804). Felix (1806), Agapito (1808), Maria (1810), Refugia (1812), Augustina (1814), Francisca (1818). She discouraged her children from using guns, for fear they would be perceived as bandits. At first she home schooled her children. Later, Doña Patricia sent her children and grandchildren to Spain and Mexico to be educated. When José María Jesús Carbajal platted the town of Victoria, she made sure land was set aside for a school and a church. Her donation of $500 in gold helped to build and furnish the church, Nuestra Señora de Guadalupe (Our Lady of Guadalupe), the second oldest Catholic parish in Texas. Empressario Martín De León died in a cholera outbreak in 1833 and left an estate worth $500,000. (Imagine what that would be in today’s currency.) Eldest son Fernando took over the colony responsibilities of his father. 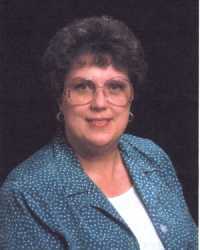 Doña Patricia, an excellent bookkeeper, managed the family assets and continued her civic work. She and her family supported the idea of an independent Texas and smuggled arms and ammunition from New Orleans to the Texans. 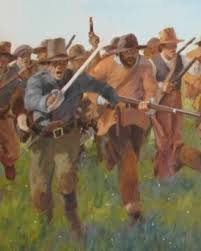 Despite their support of the Texans, however, the De Leóns were victims of the anti-Mexican sentiment that swept through Texas after the Texas Revolution. Her youngest son Agapito was murdered in 1836 by cattle thieves. Like many Mexicans, the De León extended family was opposed to the regime of Antonio López de Santa Anna. Texas independence was a separate issue. As the issue did with other Mexicans living in Texas, it divided the De León extended family, some of whom helped change the course of history in both Texas and Mexico. Divided loyalties among the Mexicans made them subject to suspicion and prejudice from the new Republic of Texas government and military establishment. 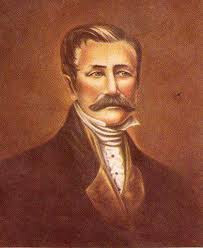 Candelaria's husband José Miguel Aldrete was 1835 state land commissioner of Coahuila y Tejas. 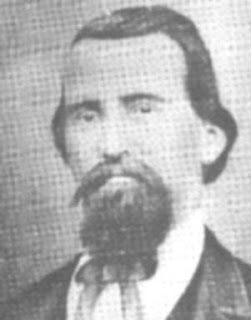 Aldrete joined several Texas insurgent groups to resist Santa Anna. Refugia married José María Jesús Carbajal in 1832. Initially, he teamed up with Fernando De León and Peter Kerr, to trade livestock for munitions to help his old friend and mentor Stephen F. Austin. Carbajal, however, felt his loyalties lay with the Mexican people, not the Texas cause. He moved across the Rio Grande and waged guerilla warfare in Mexico against Santa Anna's political machine. Doña Patricia loaned Carbajal $6,000 for his cause. Fernando later became aide-de-camp to provisional Texas governor James W. Robinson. Maria had one daughter with her husband, Mexican politician and military officer Rafael Manchola. He died in the cholera outbreak that killed Martín de León. Augustina married Plácido Benavides, who opposed Santa Anna's dictatorship, but felt Texas should remain part of Mexico. Benavides led a unit of Tejano fighters at the Battle of Goliad. He was recruited by Stephen F. Austin for the 1835 Siege of Béxar to drive Martín Perfecto de Cos out of Texas. Silvestre fought beside his brother-in-law Plácido at the Siege of Béxar. Benavides earned himself the nickname of the "Texas Paul Revere" for his 1836 journey from San Patricio to Goliad to Victoria, warning residents of the approaching Mexican army. But on July 20, 1836, disaster struck for the De León family, much of whose wealth was in land and cattle. 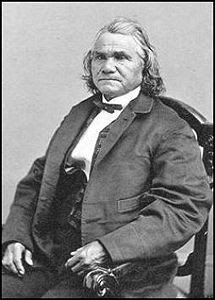 Brigadier General Thomas Jefferson Rusk ordered Mexican families in the Victoria area to be evacuated in an attempt to stem any assistance being given to Santa Anna. The Carbajal, Benavides, and De León families left for New Orleans, forced to abandon their money and possessions. In Louisiana, they lived in poverty, and then moved back with Doña Patricia's family in Soto la Marina. From half a million dollars to poverty through no fault of hers, at least she was able to sell 25,000 acres of land near Garcitias Creek for $10,000 in 1837. Silvestre De León returned to Victoria in 1842 to try and reclaim the family's property, and was murdered by persons unknown. Doña Patricia returned to Texas in 1844, only to find her assets had been redistributed among new settlers. In the new climate, she had lost her social standing in the community. 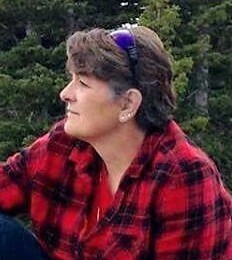 She devoted the rest of her life to church service and until her death lived as an ordinary parishioner. 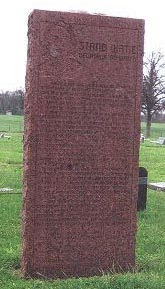 Doña Patricia died in 1849, and is buried at Evergreen Cemetery in Victoria, Texas. Before her death, she had donated the original De León homestead to the Catholic Church. She also donated altar vessels and a gold monstrance. In 1898, the church name was changed from Our Lady of Guadalupe to Saint Mary's Catholic Church, which currently occupies the site of the De León homestead. 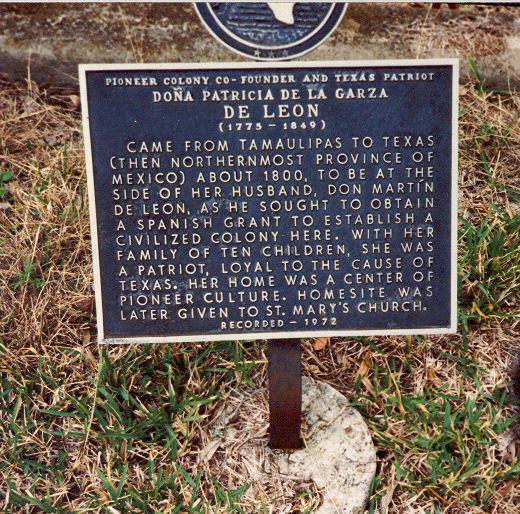 Recorded Texas Historic Landmark number 6539 placed at Evergreen Cemetery in 1972 acknowledges Patricia de la Garza De León's contribution to Texas. 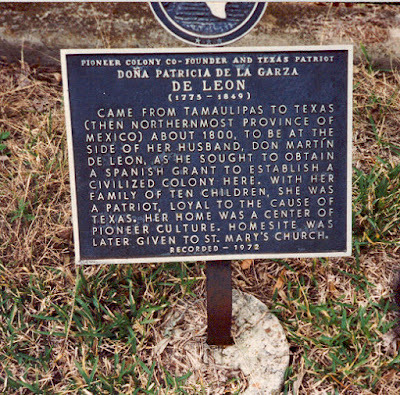 Recorded Texas Historic Landmark number 6543 placed at Church and Bridge Streets in 1936 denotes the home of Doña Patricia de la Garza De León and Don Martin De León's home in Victoria. 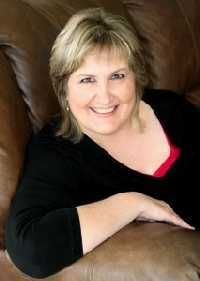 Caroline Clemmons is the bestselling and award winning author of numerous contemporary and historical romances. 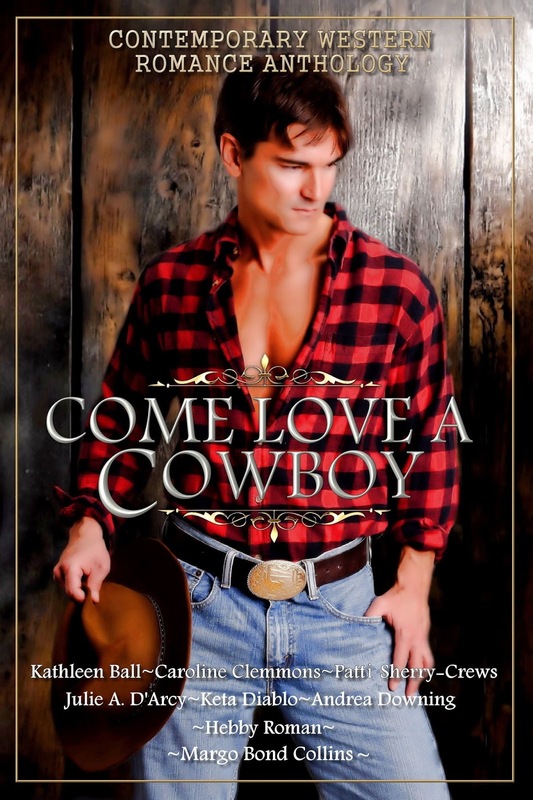 Her latest release is GRANT ME THE MOON, which is included in the eight-author contemporary western anthology COME LOVE A COWBOY, available now for pre-order at Amazon http://amzn.com/B01D5876UK. The Sample booklet with recipes, blurbs, and excerpts is available FREE at http://digioh.com/em/21875/75252/rfwtugbtpk?demail=[email]. 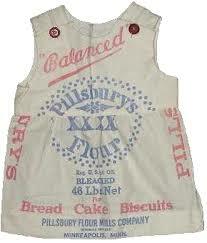 I recently read a novel set in the ‘cowboy’ era of the 1860-70’s where the woman was wearing a ‘flour sack’ dress. Whereas that may have been true in a rare case, it certainly wasn’t wide spread. Throughout the later part of the 1800’s cotton sacks gradually replaced the barrels and crates that flour, stock feeds, and other such grain based products had been shipped and stored in for years. Made of unbleached cotton, these sacks were dull and had the same large logos that had previously been stamped onto the barrels. Getting rid of the logos was almost impossible—even with kerosene, lye soap and boiling. However, that didn’t stop women from utilizing the material. 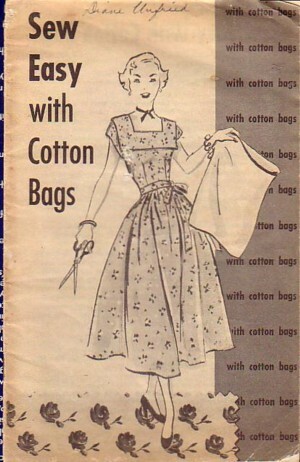 During that era, the bags weren’t suitable to make dresses. But they were usable, and frugal pioneers made rugs, towels, chair cushions, quilts and numerous other items from the sacks. Common items were nightgowns, diapers and underwear. The large logos were not an issue for these garments because they were worn under other clothing or in privacy. It wasn’t until well after the turn of the century that companies started to make bags using bright colors and designs. Printed on logos and company names were replaced with easy to remove paper tags and labels. Companies hoped the colorful and reusable bags would boosts sales which had fallen drastically for almost every business at the onset of the depression. The government supported the recycling of feed sacks, calling it a necessity due to a shortage of cotton during WWll. The sacks themselves were not very large, and several were needed for most every garment and this too brought about other thrifty activities. Bags were often sold, both to other people and/or back to the store/company to be reused, and community ‘sack’ exchanges were commonly held for people to trade amongst each other in order collect enough sacks of the same color and print. The popularity of the bags continued through the next couple of decades. Magazines, pattern makers, newspapers and the feed/flour companies created articles, booklets, and even dissolving ink patterns printed right on the sacks for women to make the most out of every yard. Sewing contests became another popular activity, locally and nationally. Often sponsored by companies in order to show off their latest prints, woman enjoyed the opportunity to show off their sewing skills. This dress, (photo from the National Museum of American History) was sewn by Dorothy Overall from Caldwell, Kansas in 1959 and took second place in the Cotton Bag Sewing contest. Why some believe our ‘age’ of recycle/reuse/repurpose and dispose properly is a new-fangled way of thinking, I believe in some instances, such as the flour sack eras, we are ‘behind the times’. My next release will be in April. 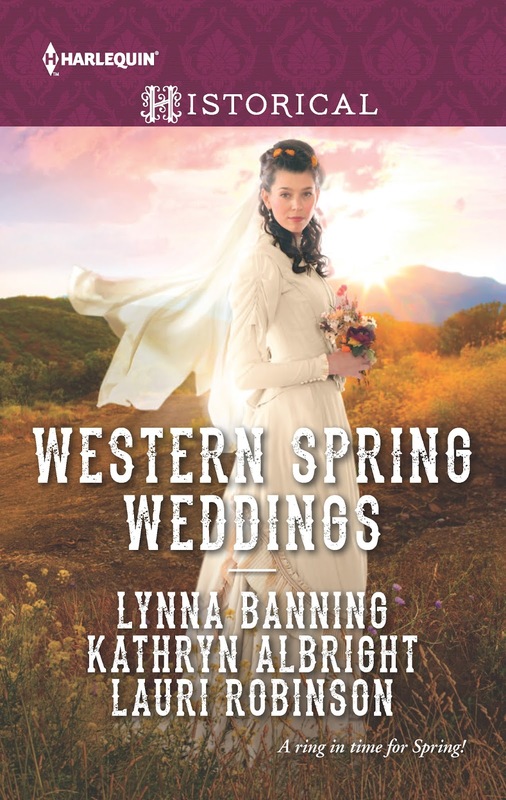 When a Cowboy Says I Do is one story in Western Spring Weddings. Little does seamstress Ellie Alexander know that by promising to sew her best friend’s wedding gown will lead to her own spring wedding! Sometimes, no matter how hard we try to stick to a writing and publishing schedule, the muse has other ideas. 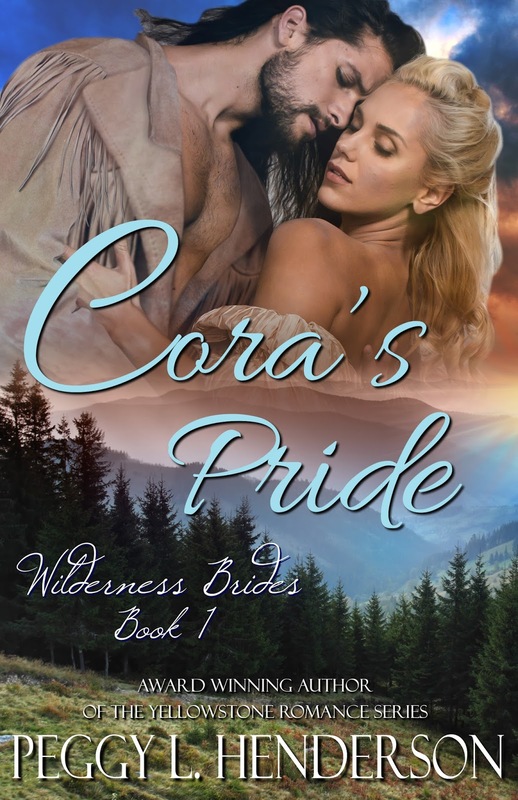 I'm supposed to be working on a Book 7 in the Yellowstone Romance Series, and then on another book in the Blemished Brides Series. That's what my "to write list" tells me. Somewhere far, far down that list is a scribbled note that says "Oregon Trail series with siblings getting lost." Well, as I was writing dutifully on my Yellowstone book one day, my mind decided to take a detour, and the first story in that Oregon Trail series popped into my head. The characters screamed loud enough over the next few days that I couldn't get another word written in the book I was working on. Reluctantly, I set my WIP aside and started charting out this new story that wouldn't leave me be. About six weeks later, I published Cora's Pride (Book 1 in the Wilderness Brides Series). 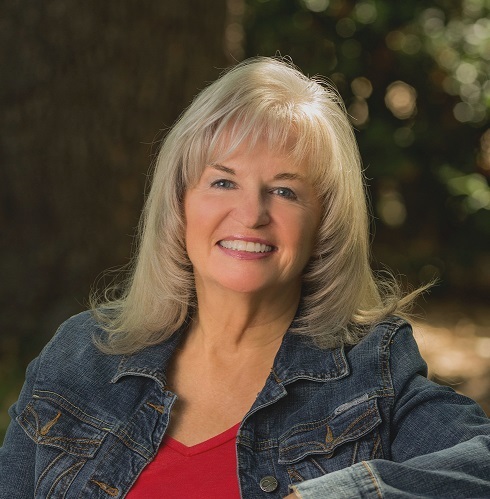 I'm fortunate to have an editor who works closely with me during my writing process, and beta readers who are quick readers. The book hit a slight snag about two-thirds of the way through, when several people thought the heroine was a bit too hard-headed. My editor dubbed the book "Badass Heroine on the Oregon Trail" initially. Despite having to go back and reworking some of the earlier chapters to soften her up a little, this was one of the fastest books I've ever written. I guess when the muse calls that strongly, you have to answer! She just wants a new start for her family, and no one will stop her. He simply wants to get home with his winter supplies and keep his scalp. Together, they're on a collision course for adventure and perhaps even love. Hot air blew on his face. Nathaniel woke with a start and scrambled to the side. His hand reached for the rifle that lay next to him even before his eyes flew open. He stared up at the dark muzzle of one of his horses and relaxed. Touching a hand to the animal’s nose, he pushed the large head away and sat up with a groan. He blinked to clear the fog from his head. Sunlight streamed in thin ribbons through the forest canopy, ending in circular patterns on the ground. “You could have woken me sooner,” Nathaniel grumbled to the horse and stood. Two, no, three restless nights were taking their toll on him. He’d come back to his camp last night, his head full of thoughts about Cora and the things he’d overheard at her camp, and it had kept him awake well into the night. When he’d set out on his journey from Harley’s Hole to Fort Hall several weeks ago, the notion that his path would cross with a woman who completely consumed his thoughts would have been laughable. Even more amusing was the fact that she wanted nothing to do with him. Perhaps he’d simply lived in the wilderness too long with his brothers and Harley, and it didn’t take much for a woman to catch his eye. Nathaniel shook his head. He’d seen plenty of women on the wagon trains that passed through Fort Hall and Fort Laramie over the years. He’d never wasted a second thinking about any of them. Besides, there were three other women in Cora’s company. 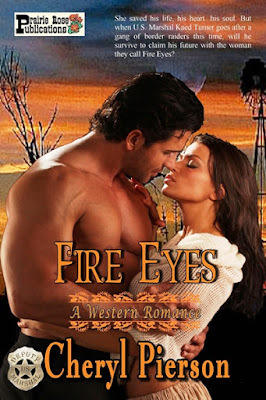 Anna Porter was polite and appreciated him, yet she didn’t catch his eye the way her friend did. He hadn’t seen or heard much from the two younger girls to make a judgment about them, other than the one named Josie wanted to learn how to shoot. 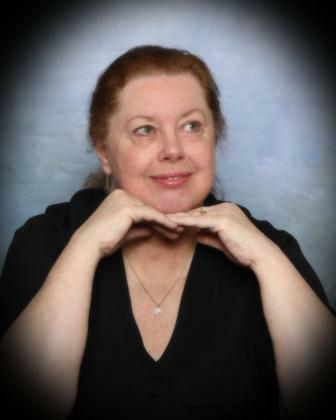 What was it about Cora Miller that held him captivated? She hated him. The horse stared back at him, his ears pitched forward. “I’m just trying to set her straight about me, that’s all.” Nathaniel bent to pick up a handful of twigs for tinder. When he straightened, he made eye contact with the horse again. “There’s nothing else I want from her.” The gelding shook his head and snorted. The gelding took a step forward, stretched his neck to sniff at the stick, then lowered his head to crop at some grasses on the ground. Clearly, this conversation was over. Nathaniel’s trusted mount didn’t believe a word of what he’d said. How will you inspire your ancestors?